Elegant and airy, lit by natural skylights and chandeliers, warmed by wood paneling, plush seating and a central fireplace, and decorated with contemporary art, books and rare objets: This quietly luxe first impression of the renovated Hotel Figueroa was not what the real estate developer Bradley Hall had in mind when the property came on the market. 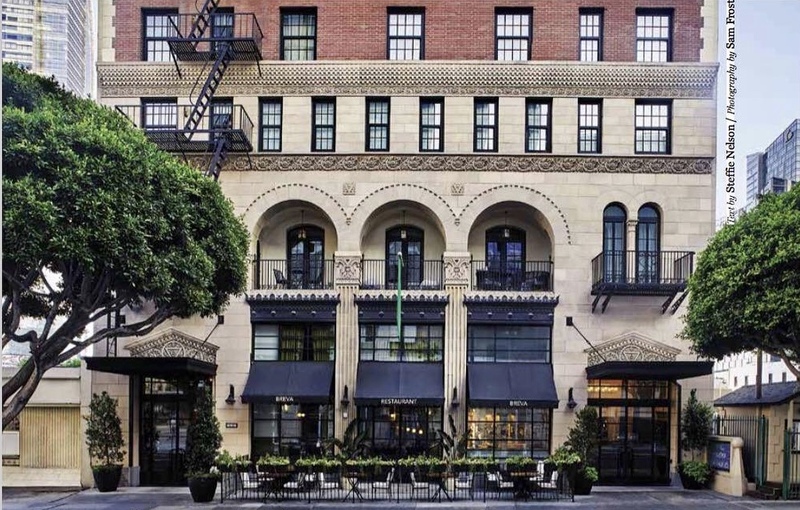 What Hall saw was a large hotel in disrepair, located just a block from L.A. Live, as the downtown boom was in full swing—in other words, a great investment. But as the layers of history began to peel away from this 1926 landmark, easily identified by the mural advertisements still hand-painted on its three towers, a surprising narrative started to take shape. Designed by the L.A. firm Stanton, Reed and Hibbard, and funded by the Young Women’s Christian Association (YWCA), the 13-story “hostelry,” as it was called, offered a refined, safe haven for the newly emancipated professional women of America, for whom solo travel was still a risky, and potentially scandalous, proposition. Not only was its 1.25 million dollar price tag the largest investment by a group of women to date, its female general manager, Maude Bouldin, was the first of her kind in the nation. The hotel was replete with feminine features like a writing salon and a beauty parlor, and, according to Hall, regularly hosted poetry readings and debates and discussions on social issues. Naturally, the hotel’s design would need to reflect this commitment to its origins, and with a portfolio that included numerous hospitality projects including the historic Hollywood Roosevelt, where they created the instantly classic Spare Room bowling alley and the Gable & Lombard Penthouse event suite, the Venice-based interior design firm Studio Collective was the perfect fit. What sealed the deal was Studio Collective’s proposal to use the hotel’s original 1926 bones as the foundation for the design concept—building upon that with timeless craftsmanship and equally refined contemporary elements. This would not be a restoration, but a “remix,” as Hall put it. The renovation, which took four years from start to finish, began by uncovering the existing architectural elements and restoring them, starting with the original YWCA iconography throughout the hotel: an inverted triangle symbolizing feminine leadership that appeared in transoms over doors and carved into the fireplace of a meeting room. “Wherever we could keep them and maintain them we tried to do so,” noted Goldstein. The symbol has also been incorporated into the hotel’s new logo. Plentiful, comfortable seating areas were designed for different uses, from intimate conversation to dining to working, in an eclectic mix of materials from leather to velvet, emerald chesterfield loveseats to louche gold loungers. Most of the furniture was designed in house, with the exception of a few revamped vintage pieces and some items—like a long wooden communal table with studded chairs that would fit right in at a Spanish hacienda—that were fabricated by artisans in Mexico. Table lamps and ring chandeliers with geometric glass shades cast pools of warm light. To flesh out the “residential” feel, shelves were stuffed with books on art, design, music, and Hollywood, sculptures, games, glassware, ceramics, and even, Kale admitted, somebody’s ashes purchased at an estate sale. “We started shopping for this about a year and a half in, and just started hoarding,” she laughed. The stylish, cozy feel and neutral palette with cool jewel-toned accents (no Moroccan reds anywhere in sight) extends to the 268 guest rooms. Beds have upholstered leather headboards and seating is luxurious, offset by natural stone and wood tables. Decorative pottery and plants dot surfaces, and contemporary prints and paintings add an electric energy. Because the existing layout of the hotel was kept basically intact, there are 35 unique room configurations, from petite chambers to expansive suites with terraces. Some bathrooms feature custom blue-and-brown fig patterned wallpaper, others have decorative tiles; some rooms have closets while others have cane armoires—which, like the round brass standing lamps that recall vintage Hollywood movie lights, nod to the 1920s and the colonial theme. The showstopper is the Casablanca suite, which has a secret entrance through a bookcase to a private dining room covered in antiqued mirror, which then leads to Bar Alta, the hotel’s reservation-only cocktail lounge. Helmed by Dushan Zaric of Employees Only, the bar can also be reached from the lobby. The pool deck is the perfect vantage point for viewing the new, orange-and-blue botanical mural on the main building. Imagined as an extension of the garden, it was designed by the British illustrator Bella Gomez and executed by Wall Dogs, the same local company that paints the mural ads. The hallway between the lobby, pool and the casually chic Veranda restaurant also serves as a gallery showcasing local photographers, with Mexican American street culture chronicler Estevan Oriol as the inaugural artist. A strong art program was an integral part of Studio Collective’s original pitch—seen as a way to link the Hotel Figueroa with the thriving art community that has steadily been migrating downtown, as evidenced by the opening of The Broad museum, and major galleries like Hauser Wirth. To the credit of Hall and his partners, they took the idea a step further, proposing to establish a permanent collection of art by local female artists. The designers brought in Tiffiny Lendrum, an art consultant they’ve collaborated with regularly, and she gathered a group of rising women artists including Nancy Baker Cahill, Alexandra Grant, Lily Stockman and April Street. Working in all media (painting, textiles, photography and sculpture), their pieces reflect on the female body, the feminine experience, and Los Angeles itself, boldly greeting those who enter the building. But the most arresting, and germane, artwork must be the portrait of Maude Bouldin, the iconoclastic general manager, that hangs across from the check-in desk. Commissioned from the Santa Monica-based painter Alison Van Pelt, it pictures Bouldin seated on her motorcycle (she also flew airplanes), gamely meeting the viewer’s gaze. Rendered in a brilliant scarlet, perhaps the only pop of red on the entire property, Van Pelt’s signature dreamy, blurred brushstrokes give Bouldin the impression of being in motion—moving fast, into the future.